Community is an important part of our philosophy at Cedar County Vet. We are happy to support several programs making a difference in our hometowns and our hearts. In response to an overwhelming need, we now offer low cost spays and neuters for feral and farm cats. This program includes anesthesia, pain medication, an ear tip for identification of sterilization, and a rabies vaccination. To date, over 300 cats have been spayed and neutered through this program! For more information, please visit this page. Euthanasia, rather than trap-neuter-return (TNR), of unwanted cats creates a "vacuum effect". For each set population or colony of cats, there is a food source and shelter, intended or not, that will sustain a certain number of feline occupants. 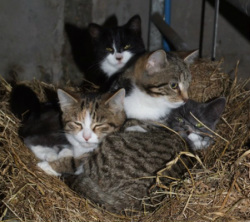 If cats are simply removed, new cats will fill in and continue to breed and reproduce, elevating the number of unwanted cats in both that area and others close by. When a cat is spayed or neutered and returned into their population, they "hold" their spot and will not allow new cats to enter the population. If you take into consideration that an adult female cat and her offspring can produce over 400,000 kittens in a seven year period, it is easy to see why TNR works! The highest compliment we can receive is when you refer your friends, family, neighbors, and coworkers to Cedar County Veterinary Services. We take earning your loyalty very seriously, so when you refer a pet, horse, or livestock owner who then becomes our client, we want to show our thanks through our Referral Rewards Program. As we receive new clients, they are asked how they learned about our clinic, and if they are referred by you, we will enroll you in our Referral Rewards Program. For each new client referred, we will send you a thank you and automatically put a $10.00 credit on your account. This is our way of saying thank you for your confidence in our practice and our team! We love our jobs and want to help cultivate the next generation of veterinarians and veterinary technicians! We offer job shadowing for middle and high school students, internships for pre-vet and veterinary technician college students, and externships for those currently enrolled at an approved veterinary university. Depending on the time of year and level of the student, different opportunities and experiences are available. We try to offer as much hands-on experience as possible and offer time for questions and case study. If you are interested in our internship/externship program or would like to job shadow, please download and complete the following application. Please note that space in the program is limited and all applicants will be interviewed prior to assigning dates for a program.